Virginia L. Nedden, 79, of Bloomington, formerly of Sullivan passed away 11:17 a.m. Sunday, February 26, 2017 at St. Joseph Medical Center, Bloomington. Funeral services will be held 1:30 p.m. Thursday, March 2, 2017 at McMullin-Young Funeral Home, Sullivan. Visitation will be held after 12:00 p.m. Thursday at McMullin-Young Funeral Home, Sullivan. Burial will be in Greenhill Cemetery, Sullivan. Memorials may be made to the Donor’s choice. Virginia was born November 6, 1937 in Decatur, the daughter of Orville J. and Mildred D. (McCune) Isaacs. She married Wayne R. Nedden on August 2, 1959 in Sullivan. Wayne passed away February 27, 2017. 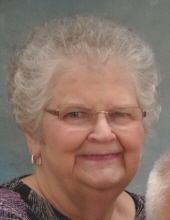 She was a member of St. John’s Lutheran Church, Bloomington. She is survived by her son, David Nedden of Bloomington; daughter, Leslie Nedden Manning of Bloomington; brother, Richard (Jamie) Isaacs of Sullivan; granddaughter, Michelle (Brandon) Colby of Bloomington; great-grandchildren, Austin and Emma Colby. She was preceded in death by her parents, and one sister. "Email Address" would like to share the life celebration of Virginia L. Nedden. Click on the "link" to go to share a favorite memory or leave a condolence message for the family.